By Publisher in Motofinder on December 18, 2013 . Are you looking for Used Cars For Sale. 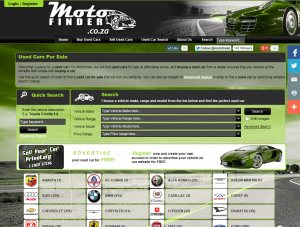 Then Motofinder.co.za is the place to find it. With 6000+ cars to choose from, we are sure you will find what you are looking for. We’ve recently reached 12 000 Visitors in a rolling 30 day period and we have already reacked 1000+ likes on Facebook. Only have access to the internet via your mobile phone? No problem, the site works perfectly on any iPhone/iPad/Samsung/Android/Blackberry or Opera device.